In the 80’s I grew up in Bermagui. My mum, dad, big sister Amber and I lived at Barragga Bay, in a spotted gum forest dotted with burrawongs. This was where my parents built our family home, “ Apocalypse Cottage”. At the age of 10, we moved away to Sydney. Over the years, I would regularly return south to see family friends. When I was 20, I was very fortunate to live in Bermagui again for a month, with a family friend, Clayton. Bermagui has always felt like my home. This show is a celebration of my feelings of this special part of the world. I hope it captures what others feel about this amazing place, too. To create these works, I had to juggle my freelance graphic designer/ illustration jobs and my responsibilities as primary carer to our child. It’s hard to find time for anything creative, but with encouragement of my wife Bec, we worked out a way for me to fit my creative work into our lives. I moved my studio area into dining room, so I could draw at any moment while still being available to our daughter. The moments in between breakfast and the school run have yielded 16 new artworks within a few months. Drawing from memory became a powerful tool, too. Every picture except the Wallaga Lake drawing* is completely from memory. I discovered that drawing from memory, I could hit the right emotional tone of my feelings of these people and places. I also loved the freedom of being able work anywhere, because my only reference was coming from my head all I needed to get it down was pencil, pen and paper. Digital prints: $15 each (these are the prints displayed in this show. Spares in stock at the Gelati Clinic – please see staff). 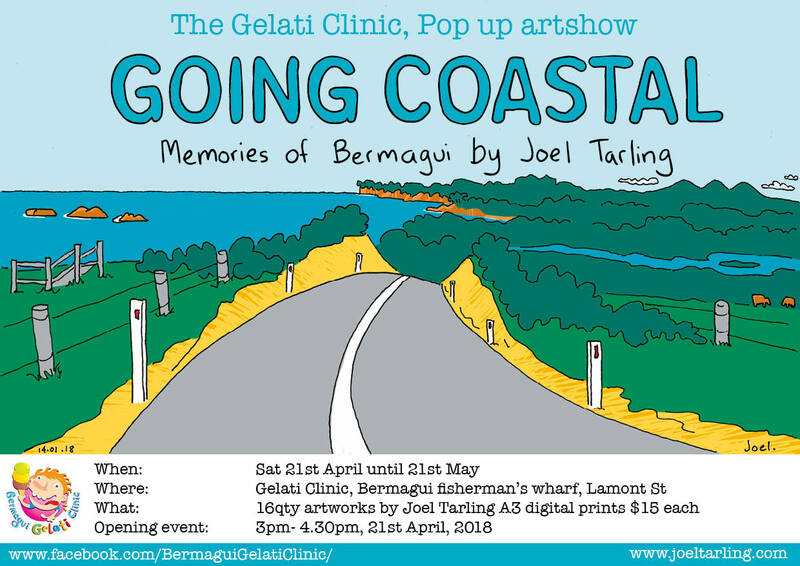 Joel Tarling spent 5 years as an editorial cartoonist for The Sydney City Hub 2004 – 2008. His work has also featured in The Green Weekly, The Big Issue and AVANTcard postcards. Aside from cartooning, he has also worked with Frenzal Rhomb, Trout Fishing In Quebec, Old Spice Boys, Mic Conway and various other bands. At high school he did work experience with renowned artist Martin Sharp, and wrote a series of comic zines called “Dopey Tales”. Over the last few years he has been writing and illustrating picture books. For more, visit http://joeltarling.com. *The Wallaga Lake drawing was created by referring to an actual sketch drawn of the bridge, sitting on a piece of driftwood at the location three years ago.